All my wireless devices, whether its an iphone or laptop have trouble when roaming around the house. It seems that it does not connect to a stronger meshpoint and continues to connect to the weaker signal. If i turn off wifi for a second on the device and reconnect its fine. but the minute I get up and move I have the same problem. @trent-rains Hi Trent! Have you enabled the seamless roaming options in router setup portal? @trent-rains Every device makes its own decision when and where to roam. This is not controlled by AP. Yes, we try to influence this decision by means of band/router steering and 11 k/v. But final decision is always made by device itself. In order to find the next AP to connect to, the device must scan first. From our experience, usually MacBook do not scan and do not roam unless signal becomes very low. iPhone is more active scanner, it has higher chance to switch to stronger AP. Android devices are all different - their roaming behaviour depends on particular brand, model and OS version. Actually lower signal does not always mean lower speed. Usually speed degradation occurs only where signal level is really low. But it depends on multiple factors. 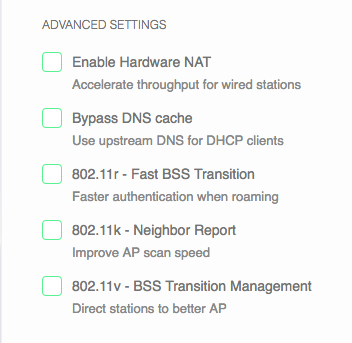 @ubnt-gunars No I was unaware of this option. I do not see this in the iOS app interface. Is there another way to access it? @trent-rains I'd like to know this too. This is a huge problem for me. I frequently have to toggle wifi off and back on again on my iOS devices and frankly I'm about ready to toss my amplifi kit completely. I may have had dead spots with my single Netgear router, but at least I could guarantee it would work when I'm 5' away from it with clear line of sight. My next plan is to disable the mesh routers and see if that's any better. Weaker signals would be okay as long as I could actually get network reliably. @maj170123 Which setting is it? Not 100% clear from the earlier description. This is not controlled by AP. Yes, we try to influence this decision by means of band/router steering and 11 k/v. @maj170123 So try enabling the last two options? @maj170123 Thank you, I was able to access it. I could not initially because I was on a Remote Desktop connection from work (apparently this wouldnt let me access it). So I was able to when I got home. I have enabled the k and v options and will report back if this helps my problem.